Roll up, roll up - the next generation of mobile processors is here with the Nvidia Tegra 4 blowing its predecessors out of the graphics processing, power-effiency water. Rocking a frankly mind-boggling 72 custom GPU cores (that's six times the horse power of the Tegra 3), Nvidia is boasting of record setting performance and battery life from the Tegra 4. It reckons you can up web browsing speeds by 2.6 times, enjoy better app performance and watch up to 15 hours of HD video playback on phones with the new processor. The Tegra 4 manages this by running a low-power setting during standard use, and PRISM 2 Display tech which reduces backlighting while busting out that high-def imagery (it can even support 4K Ultra High Def graphics). It puts the quad-core Cortex-A15 to good use, allowing for LTE connectivity (optional chipset for global 4G), HDR photography as standard and superior visuals across the mobile board. 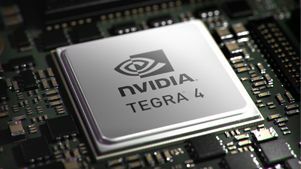 No word when we'll see the first Tegra 4 phones and tablets coming our way yet, but Nivdia itself has already revealed an Android-powered Tegra 4-toting game player dubbed Project Shield - when we can get our mitts on it is another story - we'll keep you posted. We certainly hope to lay eyes if not hands on Project Shield at CES 2013, so stay tuned.